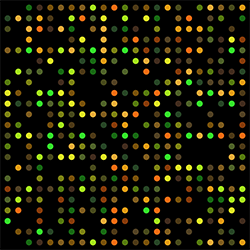 The Center for Vertebrate Genomics (CVG) was created to enhance research and education in vertebrate genetics and functional genomics at Cornell University. 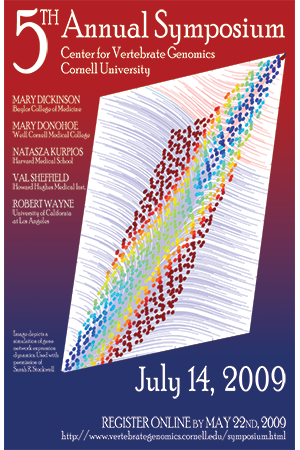 As part of that overall goal, the CVG aims to foster research interactions amongst vertebrate geneticists and other faculty. The monthly "Verge" meetings were started to increase awareness among CVG members of the different research programs that currently exist on campus, to share up-to-date information from conferences and the scientific literature, and to encourage interactions between CVG members. 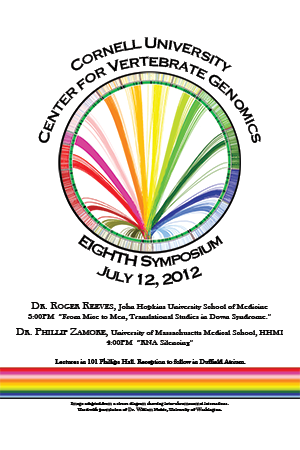 The symposium is an outgrowth of these monthly meetings, where we will learn more about the exciting research in vertebrate genomics that is being conducted outside of Cornell, through presentations from distinguished invited speakers, and within Cornell, through a poster session where graduate students and post-doctoral fellows of CVG labs can showcase their own research. 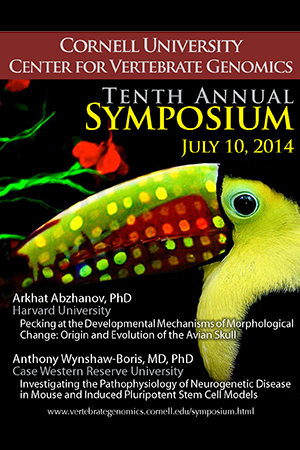 The symposium is now held biennially in July. 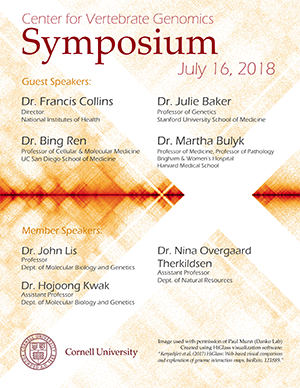 Our thanks to everyone who attended the very successful first CVG symposium, which included a poster session with over twenty posters and a banquet. 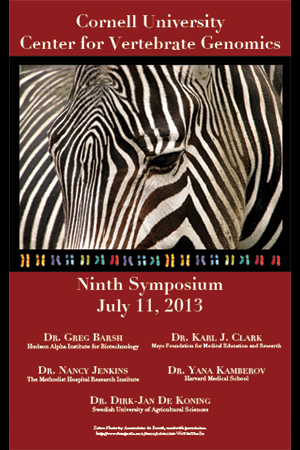 Understanding the genetics of behavior. 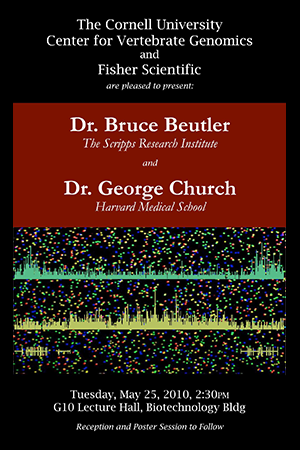 The mouse as a model system. Epigenetic lessons from livestock: unraveling the molecular basis of polar overdominance at the ovine callipyge locus. 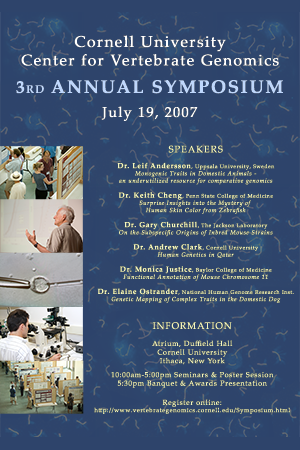 Our second symposium moved to Duffield which provided a larger lecture hall, and more space for the poster session. An awards dinner followed the event. 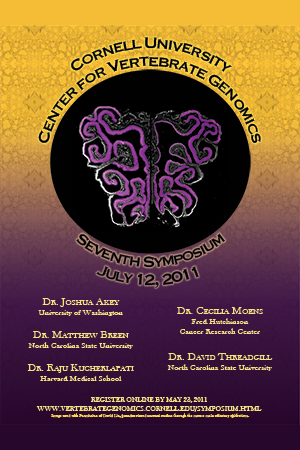 Genetics and genomics of behavior in mice. 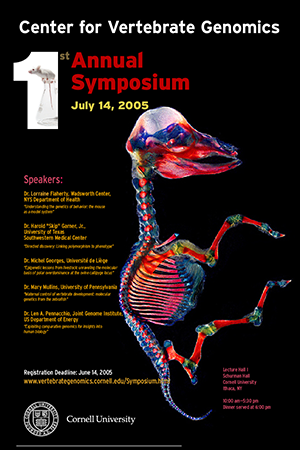 In 2007 the symposium included a large poster session and an awards dinner. Monogenic traits in domestic animals - an underutilized resource for comparative genomics. Evolutionary genomics of domestic and wild canids. 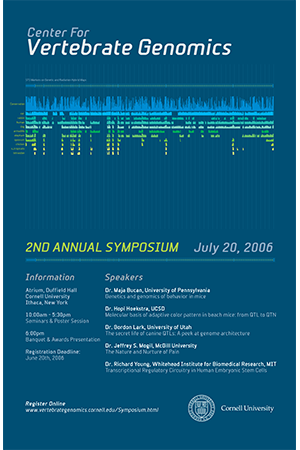 In 2010, the CVG Symposium was combined with our annual member reception and a laptop poster session. 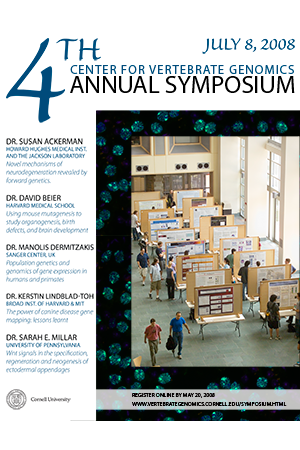 In 2014, the Center for Vertebrate Genomics (CVG) held an afternoon symposium in Duffield Hall, featuring two distiguished guest speakers, and a poster session to showcase the research of graduate students and post-doctoral fellows from CVG member labs. 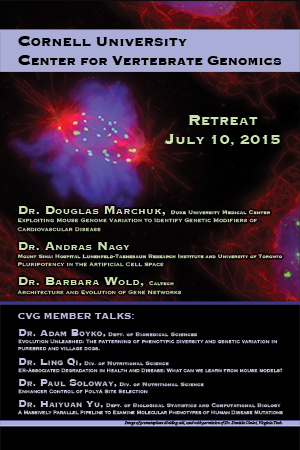 In 2015, the CVG held an off-campus retreat at the Cornell University Laboratory of Ornithology. This facility also houses part of the Cornell University Museum of Vertebrates (CUMV), and Dr. Irby Lovetter led CUMV tours for our retreat participants. The Retreat also included a laptop poster session. Another important part of the retreat was to convene working groups charged with assessing the Center's activities and future directions. ER-Associated Degradation in Health and Disease: What can we learn from mouse models? 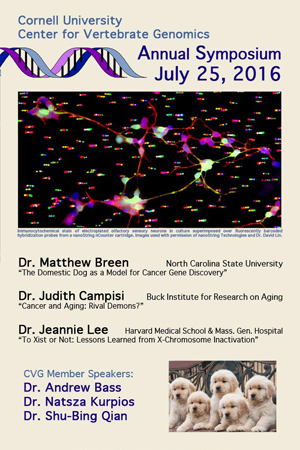 The Domestic dog as model for cancer gene discovery. In 2018, the CVG held a full day symposium in the newly renovated Schurman Hall of the College of Veterinary Medicine. The event also included a laptop poster session and reception held in Schurman's upper atrium. Cornell University, Ithaca, NY 14853-6401. For questions or comments about this website, please e-mail cw25@cornell.edu.